After much waiting, the House finally unveiled the full details of its budget last night, including its plan for teacher pay. Unfortunately, the plan is disappointingly unambitious, failing to provide the significant pay raises required to attract and retain the best possible candidates into the teaching profession. Astonishingly, the House fails to fully-fund this unambitious plan. Average raise: Overall, the House has the least ambitious teacher pay plan. The average raise for existing teachers returning in to teach in the 2017-18 would be 6.2% under the Governor’s plan, 3.8% under the Senate’s, and just 3.4% under the House proposal. 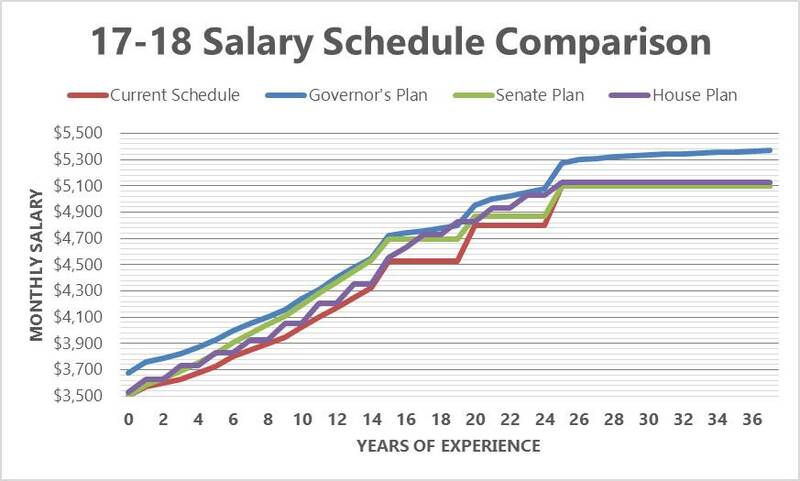 Beginning salaries: For beginning salaries, the House proposal falls somewhere between the Senate and Governor’s proposals. The Senate leaves beginning teacher salaries unchanged at $35,000, while the House plan would slightly increase starting pay to $35,300. The Governor proposed increasing starting teacher pay to $36,750. Experienced teachers: The House budget provides small raises of $300 to teachers with 25 or more years of experience. While better than the Senate, which proposes freezing the salaries of these teachers, the House raises fall well short of the four-to-five percent increases provided to experienced teachers under the Governor’s plan. The House does, however, propose retention bonuses for teachers with more than 27 years of experience. Eligible teachers could receive up to two annual bonuses of $2,500 (total bonus of $5,000) if they commit to teaching for 2 additional school years. For teachers, your preference for the House or Senate proposal might depend on your years of experience. Compared to the Senate plan, the House plan is more advantageous for teachers moving to steps 0, 1, 3, 5, 17, 18, 19, and steps 21 and greater. All other steps would receive higher raises under the Senate proposal. The House plan is also more beneficial to school counselors. The House pay plan includes a provision that effectively provides counselors with a six-year jump in their years of experience. The other interesting detail of the House teacher pay proposal is that it is not fully-funded. Using traditional methods to estimate the cost of salary proposals, the House should have budgeted approximately $119 million for their teacher pay plan. The House budget, however, only provides $105 million. Admittedly, there is always a fair amount of informed guesswork involved in estimating the cost of a teacher salary proposal. It is difficult to predict which teachers employed this year will show up to teach again in the 2017-18 school year. Generally, turnover results in experienced, higher-paid teachers being replaced by less-experienced, lower-paid teachers. When turnover is higher than expected, money budgeted for teacher salaries goes unused, and is returned to the state’s General Fund at the end of the fiscal year. When turnover is lower than expected, the Governor’s Budget Office can be forced to implement budget restrictions in other budget areas to ensure that teachers continue to receive their rightful salary. It’s safer to over-budget than to under-budget. As a result, under-budgeting is quite rare. During the 2016-17 fiscal year, however, it appears the state has under-budgeted teacher salaries. Even using the traditional method to estimate the cost of the 2016 salary proposal, the actual cost of teacher salaries has been running approximately $8 million above budget. This would mark the first time the state has under-budgeted teacher salaries since at least the turn of the century. One would assume that this rare event would cause the General Assembly to become more conservative in its approach to budgeting teacher salaries, erring on the side of over-budgeting. The House, however, has inexplicably moved in the other direction, taking a more reckless approach that – if followed in the final budget – will increase the likelihood of shortfalls in future education budgets. The NC “Law Makers” should be ashamed. If a teacher has 25 yrs. experience they want to run them off. They want to give rarises to the inexperienced teachers (under which students are failing. )..good going …time to vote them all out..